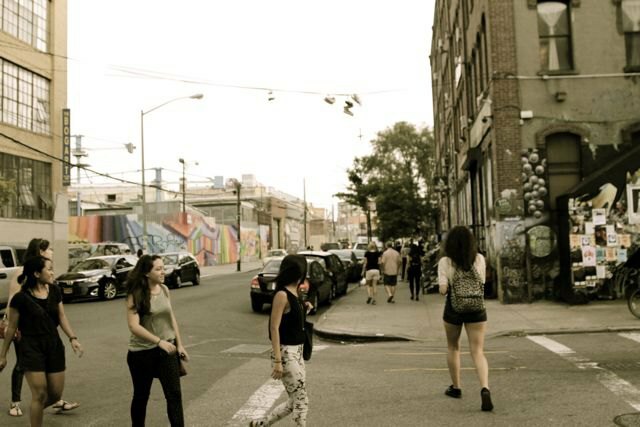 Bushwick Ain't No Disneyland: Do You Also Find it Hard to Show Bushwick to Tourists? I zigzag my way through the roaming Boar's Head trucks and Morgantown residents wearing sunglasses and mismatched pajamas (it somehow works as a stylish outdoor outfit) who are smoking and loitering on the benches in front of Brooklyn Natural and Cafe Swallow. "Young lady, got some change?" an older man standing in front of the overpriced grocery store asks me. It's freezing and his words turn into steamy chunks as he releases them from his mouth. I am not lying when I quickly shake my head, apologizing for the lack of cash funds on me. A couple of months ago I made an internet pen friend. A 17-year old Nicole from my home country, Slovakia, emailed me a short story she wrote about Bushwick, a place she's never been. She was inspired by an an interview with me in a Slovak glossy women's magazine. I was a crazy enough example of a young Slovak who not only left the country for New York, but also left behind a promising career in law to start a hyperlocal blog in a strange neighborhood nobody's heard of (in Slovakia). Media back home were beginning to take notice, though, and as a result I received a couple of emails, Facebook messages and friendly pokes from people like Nicole, who I thought, was adorable in the way that only a 17-year old can be. The story she wrote was set in this dream neighborhood of Bushwick, which she portrayed as the most amazing and beautiful part of New York City, if not the world! Last week I received another excited email from her - she had persuaded her mother to take her to New York City! And after having climbed 30 Rock, shopped at Century 21, and almost freezing on the ferry to and back from Ellis Island, they were finally coming to what was supposed to be the cherry on top of this (big apple) touristy cake. They were coming to Bushwick. As I waited for them on that Morgantown corner, desperately trying to get warm, I suddenly realized that I wasn't quite sure how to even approach the entire subject of Bushwick. What was it about Bushwick that has made my heart pound so hard and loud for years? How to even begin to explain the beauty and above all the energy of Bushwick to a 17-year old and her mother who have lived their entire life near the historic center of Bratislava, who regularly make shopping trips to Vienna and admire the historic architecture of Prague? The fire in my heart burns for this crazy little town where pigeons fly in formations, people eat tacos right from the production line and folks I meet in coffee shops are simply the most interesting human beings involved in the most interesting projects. But how to show it all one afternoon? I shook hands with her her mother and hugged Nicole who glanced at me shyly like I was the Slovak version of Britney Spears. My heart tugged, and my mind raced. I will not disappoint. "So this is Morgan! It's like a really popular Bushwick subway stop. Though it's not technically in Bushwick...ehm..." My companions looked back at me with confusion. "Hmm...How to explain why a subway stop, which is not in Bushwick, is very important for a Bushwick tour...Well, nevermind. Let's just walk..."
"This big yellow building," I pointed at 56 Bogart, "is amazing. Full of galleries and artists studios. Hub of creativity," I'm offering Bushwick highlights. "But we can't go there," I realized it was Tuesday and all the galleries were closed. "On our right side is Roberta's, the most famous restaurant in Bushwick and probably the world," I say, proudly pointing to the converted garage and trying to remember all The New York Times write-ups and insane hype this place has received over the years. But the faces of my companions show only a reflection of a converted garage with a question mark. "It's like, really cool," I add quickly. "They grow their vegetables on the roof, and Jay-Z and Beyonce probably had dinner there once." I'm winning some points for Bushwick. "But we can't go there because there is a really, really long wait," I quickly lose all those previously hard-earned points. I decide to take them to Tandem. The walk there, I think, will give them a good idea of the industrial as well as residential character of my beloved neighborhood. Plus we'll get to enjoy some artisanal beers at the end of their brief visit. My stream of thoughts is interrupted by a sharp and loud sound coming from the depths of Thames Street just as we pass it. "Was that..." the mother asks with a pale face, "...a gunshot?!" "Nah, absolutely not," I say, forcing a smile on my face. I suggest that we walk faster. I ramble through the rest of our walk about lofts and how cool it is to live in one of those. "You know...They're large sunlit rooms," I'm throwing in a couple of impressive keywords. I think I've partially won Nicole over but her mother doesn't seem to be buying any of the advantages of living in a converted factory space. Moreover, she is still pale from what was most definitely a faraway gunshot. Not that I was going to admit that any time soon. I hold aside the heavy curtains at the entrance to Tandem for my companions to walk in. We take a nice table in the middle of the room, and Terry hands us a menu. Now comes my triumph! We'll do what Bushwick is the best at! We'll enjoy the bonding experience that only a round of heavy artisanal beers can bring, and my friends will understand the Bushwick magic immediately. "She'll take a Coke, and a glass of rosé for me," the mother places an order and I realize: "Nicole is only 17! Duuh! That's not enough years of age to buy a drink in Slovakia, not to even mention here." I am the only one sipping on my Brooklyn Lager, the winter season edition, but I can't find the pleasure in it. It seems like my drink is too dark and stormy today. Back on the cold on Troutman Street, I swallow a scream when a rat sprinting to a trash can almost touches my feet. "Maybe they didn't notice," I tell myself. I'm about to give up hope on trying to explain Bushwick to them when I notice a smear of joy in the face of Nicole's mother. "Will you now walk us back to the subway to Manhattan?" I shook hands with her mother and hugged Nicole goodbye at the Jefferson L stop, and walked home slowly breathing in this neighborhood that so desperately failed to deliver as a tourist destination. Walking its wonderfully imperfect streets, greeting my old friends, seeing the ugly corners, I realized that Bushwick is far from Disneyland. It is a real place, and once you fall in love with it there's just no falling out.